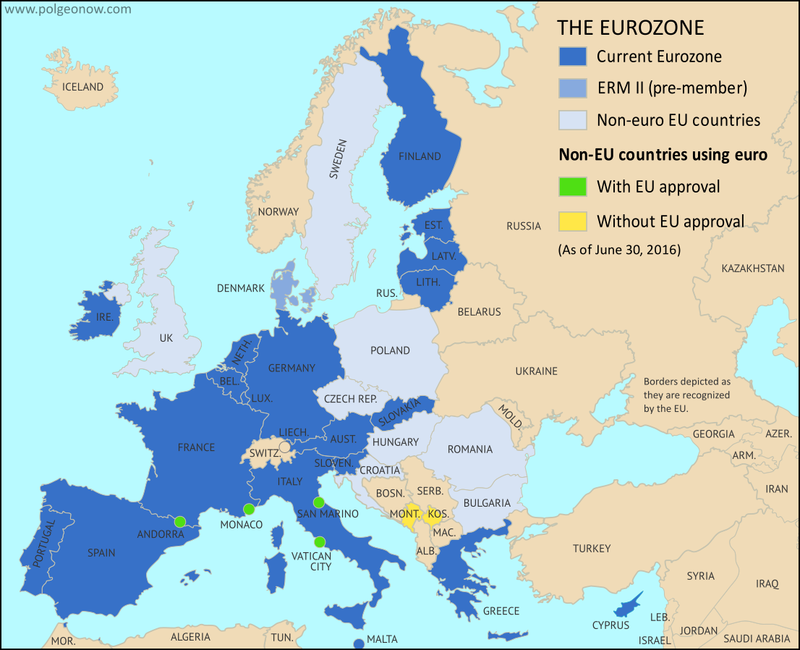 Officially called the "euro area", the Eurozone is a nickname for the group of countries in Europe that share a single currency, called the euro. The euro currency is administered by the European Union (EU), but many countries in the EU don't use the euro, and some countries outside the EU do use it. The European Central Bank, the governing financial body of the Eurozone, is headquartered in Frankfurt, Germany. Germany, along with eleven other EU countries, became a founding member of the Eurozone in 1999. Since then, eight more members have joined after meeting the five necessary economic criteria. This has brought the total to nineteen members, including all but nine of the 28 European Union member countries. Which EU Countries Don't Use the Euro? One country, Denmark, is part of the European Exchange Rate Mechanism (ERM II), which ties members’ currency to the euro and is a necessary step for joining the Eurozone. However, Denmark is allowed to opt out of adopting the euro, despite its ERM II membership. All members of the European Union were required by the Maastricht Treaty of 1992 to change to the euro after meeting the criteria. However, both Denmark and the UK negotiated exceptions to the requirement later in that year. Seven other EU members are still required to adopt the euro in the future. Which Non-EU Countries Do Use the Euro? There are four tiny countries outside the EU - Andorra, Monaco, San Marino, and Vatican City - that have monetary agreements allowing them to use the euro as their official currency. Meanwhile, two other EU non-members, Montenegro and the disputed Republic of Kosovo, have unilaterally adopted the euro without coming to any agreement with the Central Bank. The EU has expressed its dissatisfaction with these unilateral adoptions, but the currency’s use in the two countries has gone forward anyway. What Next for the Eurozone? Many countries sought Eurozone membership at the beginning of the financial crisis in 2008, but most became less interested after the euro was hit by its own crisis in 2009. Meanwhile, Danish polls suggest the country is unlikely to support moving to the new currency any time soon. However, all EU members except Denmark and the UK are legally required to eventually adopt the currency. 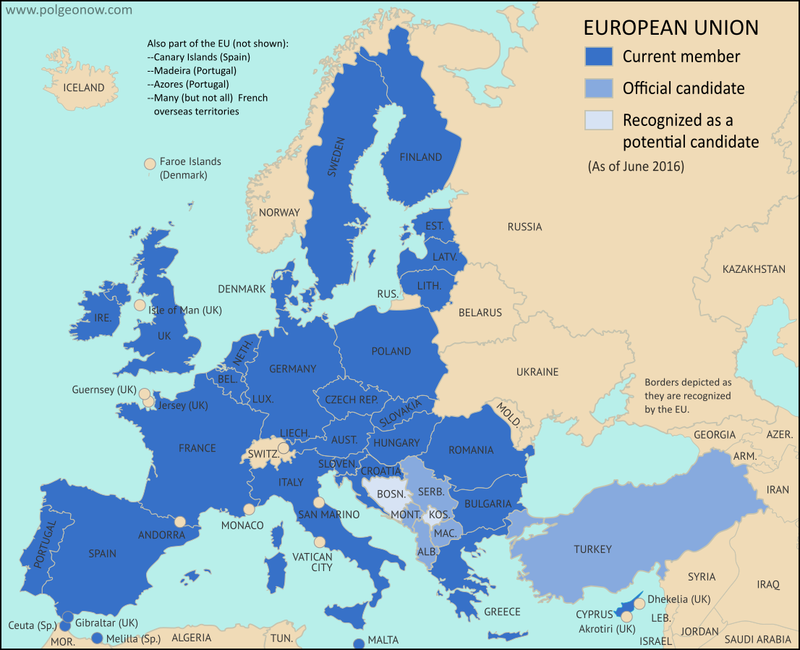 You can stay up to date on Eurozone membership by bookmarking this article (which will be updated if anything changes), or by checking Political Geography Now for new articles about countries joining or leaving the Eurozone. You can also sign up for email updates from the box on the right-hand side of this page, or follow PolGeoNow on Twitter for even more news and facts!